Beef Shorthorns met a strong, level demand driven by the commercial sector in Stirling on Monday 20th October at the breed’s official autumn sale where bidding peaked at 6,500gns and 90 females sold to average £2,172 and achieve over 90% clearance. “The day’s trade reflected the continuing keen demand from commercial producers for a functional suckler cow,” commented the society’s Frank Milnes. Sale leader at 6,500gns was Chapelton Festival, a roan 26 month old within the breed’s top 1% with a TI+33, SRI +30. 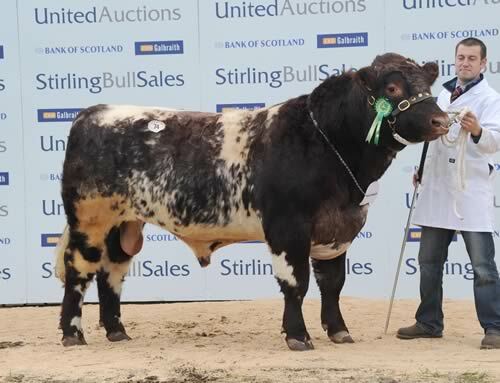 Bred and exhibited by Donald Biggar, Festival was by the 6,800gns Glenisla Banquo and out of a homebred dam that came from a line of prize winning females from his 75 cow herd based at Castle Douglas. Festival went to join D and S Calder’s Grandtullybrae herd, Aberfeldy. Next at 5,500gns was Coldrochie Factor TI +12, SRI +6, a two year old roan from Douglas McMillan, Luncarty, Perth to WJ and J Green, Garmouth, Fochabers. Sired by LS Zeus and out of a Colnvalley dam, he was no stranger to the ring having collected a number of tickets including senior male champion at the 2013 Stars of the Future. Galla Gold TI +25, SRI +24 was a white 18 month old by the 5,400gns Kidston Rambo and out of a homebred dam from Jim Frame’s 23 cow herd based at Wiston, Biggar. He sold for 3,500gns to JS McLaren, Ballinluig, Pitlochry. Minutes before, a 3,500gns call was made by Messrs Coutts, Inverness for Knockenjig Glenlivett TI +21, SRI +20, a 19 month old Meonhill Charlie Chaplin son and out of a Glengoy bred dam from David and Rosemary Dickie, Knockenjig, Sanquhar. Other bulls in the money included the last lot in the ring, Glengoy Dollar TI +16, SRI +16 at 4,000gns to KG and E Anderson, Ancrum, Jedburgh. Bred by D Macleod, Dollar was a white Glenisla Zinzan son and stock bull from P Scott Taylor’s Barnaigh herd which was undergoing major reduction. Mr Scott Taylor led the female trade at 5,000gns with a cow and calf pair to T Russell and S Farmer, Standford in the Vale, Faringdon. Barnaigh Lovely Xquistite 5 was a red three year old by Tornado of Skaillhouse offered with her six month old heifer, Barnaigh Lovely Xquisite 8, by Glengoy Dollar. Russell and Farmer paid 2,600gns for the first prize Chapelton Nettle TI +33, SRI +28, a two year old Glenisla Banqo daughter from Donald Biggar, while they also went to 3,500gns for Lowther Magic TI +21, SRI +15, a 17 month old in calf heifer by LS Eagle and the highest of a string of entries from Charles Lowther, Penrith. Minutes before, Mr Lowther offered Lowther Melody TI +24, SRI +20, an 18 month roan in calf heifer by Blelack Minstrel at 2,800gns to A Rafferty, Newtonmore. Next were twin, roan, 20 month olds by Belmore Fuel Injected and out of a homebred dam from Major John Gibb, Glenisla, Blairgowrie. The pair sold to J and D Haigh, North Willingham, Market Rasen. Glenisla Eva Broadhooks G933 TI +23, SRI +20 made 4,500gns whilst Glenisla Eva Broadhooks G934 TI +23, SRI +21 sold for 4,000gns. Other leading entries from Major Gibb’s draft included Glenisla Foxglove Flake TI +16, SRI +17, an 18 month old roan Glenisla Drum Major daughter at 2,800gns to M Clough, Stape, Pickering. Also at 2,800gns was Glenisla Lovely Gazelle TI +19, SRI +17, a two and a half year old roan heifer by Carirnsmore Craig offered with her two month old heifer, Glenisla Lovely Gazelle H75 by Glenisla Artic Storm. The buyer was E Belcher, Old Daily, Girvan who took home a total of 27 lots including Douglas McMillan’s highest female at 3,200gns. Coldrochie Catriona Rosebud TI +16, SRI +19 was an 18 month old light roan by the 13,000gns Podehole Drummer. Mr Belcher’s highest purchases included 2,600gns for Coldrochie Joyful Gipsy TI +18, SRI +11, a 19 month old Chapelton Winsome daughter, 2,400gns for Coldrochie Grace Beauty TI +4, SRI +7, a 19 month old Drummer daughter and 2,600gns for Crichton Cockhorns, a 27 month old by Crichton Motivator from Brian Walling, Selkirk. A 4,200gns bid secured the female champion for Housebyres Georgiesheergorgeous TI +14, SRI +11 for Mohsin Altajir of Highland Wagyu, Dunblane. An 18 month old roan by Holmeere Horatio and out of a Cairnsmore bred heifer, she was bred by Andy Hall and Lisa Done, Moffat and was couple’s first female ever to be exhibited in Stirling since establishing their six cow herd in 2009. “We were nicely shocked. Georgie has stood out since she was born and has enjoyed success at the summer shows,” said Mr Hall. Jim Frame was again in the money in the female section with a couple of 17 month old heifers by Kidston Rambo each sharing a 3,800gns bid from G and A Kirkpatrick, Glengarnock, Beith. First to go was the dark roan Galla Guinevere TI +12, SRI +13, followed by the roan Galla Gina TI +17, SRI +16. Next at 3,500gns was the reserve female champion, Shawhill Florence Gertrude TI +22, SRI +23, an 18 month old maiden who was no stranger to the ring having been placed at four shows in the last 12 months. Exhibited by Thomson, Roddick and Laurie, Eaglesfield, Lockerbie, this Dunsyre Duke daughter went home with Laga Farms, Evie, Orkney. Two entries by the 12,000gns Perth champion, Langalbuinoch Barney led a draft from Carey Coombs, Carnwath. First to go at 3,200gns was Dunsyre Vatersay 24 TI +14, SRI +11, a two and a half year old roan to RWH and MJ Fenemore, Tingewick, Buckingham. The second 3,200gns call was made for Dunsyre Opal TI +13, SRI +9, a roan 26 month old by K and E Brown, Milnathort, Kinross, who minutes earlier paid 3,000gns for Dunsyre Lily 58, TI +18, SRI +16, another 26 month old Barney daughter. Averages: 13 bulls £3,651; 90 females £2,172.